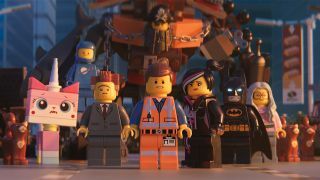 The Lego Movie 2: The Second Part is out next week, and promises the same mix of tongue-in-cheek humor, extravagant animation, and beloved childhood toys. It's also bringing a bunch of new characters along for the ride, including some familiar faces (and even more familiar voices). "This film expands [the franchise] times a thousand," director Mike Mitchell told our sister publication SFX magazine. "We've packed so much into this film, and then some. It's not only a cast call-back of every character, but we're meeting thousands of new characters, all different shapes and sizes. It's pretty stunning." This movie takes place five years after the first Lego Movie, and Duplo toys have invaded the Lego world, causing chaos and creating a wasteland called Apocalypseburg. An evil queen, a kidnapping, and a marriage proposal all mean that our hero Emmet has to head into space, meeting Rex Dangervest, and plenty more Lego characters, along the way. "Harry Potter, Thelma from Scooby-Doo... we've got Batman, of course, and the entire Justice League. We tried to pull in everyone to play their characters, so Jason Momoa is Aquaman, and we also bring back characters from the first movie," says Mitchell. "Superman is played by Channing Tatum in both films, Batman is Will Arnett, and then Jonah Hill does Green Lantern. We have Harley Quinn from Suicide Squad, Margot Robbie. It's almost like Spider-Verse, an alternate reality with all these characters." You can read the full interview in the new issue of SFX magazine - out now - as well as loads of other amazing sci-fi and fantasy news, features, and reviews. SFX is also available on Google Play and Zinio, and most digital formats give you a 30-day free trial, so you can try before you buy! For Apple users: click the link and you'll be directed to SFX's page in the App Store – once there, install the SFX app, or – if you've done that already – hit Open to be taken to the SFX storefront.